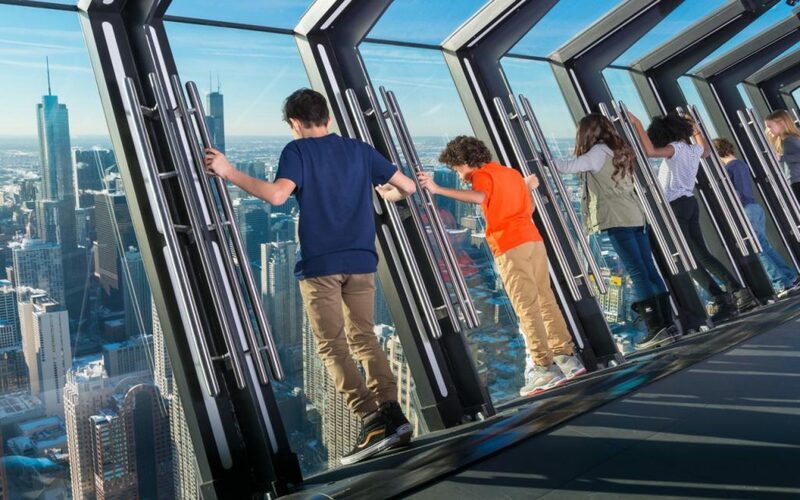 More than just an observation deck, 360 CHICAGO is a high-altitude experience perfect for groups of all ages and interests. 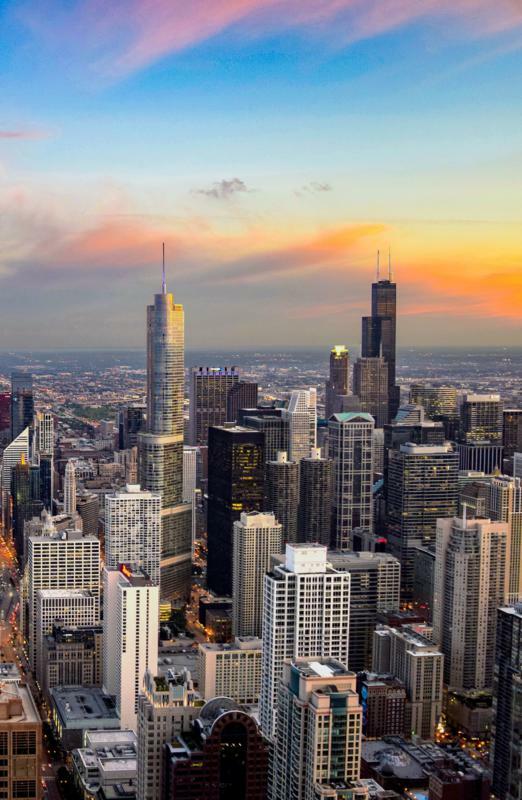 The entire 94th floor of 875 North Michigan Avenue is host to numerous cultural events and houses activities to entertain your groups for hours, all with stunning views of the iconic Windy City skyline. Convenient designated bus drop-off spaces near 875 North Michigan Avenue welcome groups before they step into the Hallway of History, an engaging look at Chicago’s urban development through the lens of different neighborhoods. Guests pass through a queue that features the music, cuisine and architecture of 9 “signature” districts and groups can learn the history of Bronzeville, Lakeview, Wrigleyville and Hyde Park while waiting for their ascent. 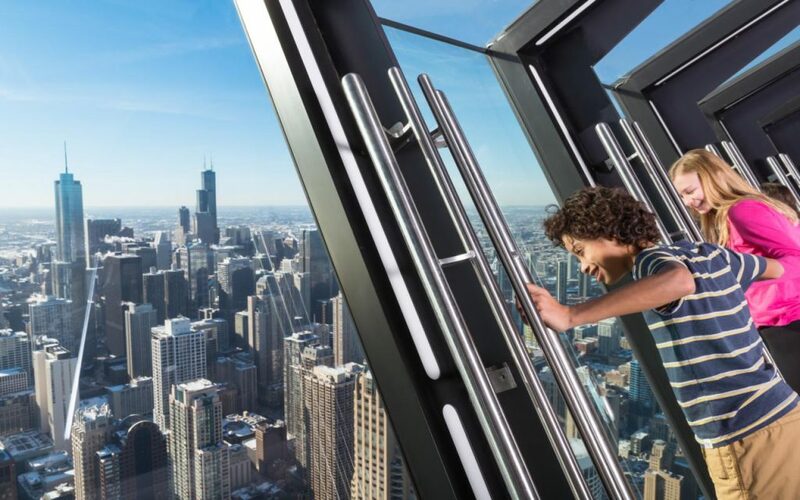 A brief elevator ride will propel your group 1,030 feet above the The Magnificent Mile™ and onto an observation deck that offers pristine views of Lake Michigan. On clear days, guests can see 50 miles in any direction and view Chicago’s surrounding suburbs and three other states (Wisconsin, Indiana and Michigan). Helpful touchscreens on all four sides of the observation deck allow you guests to zoom in on buildings and learn about their history to the city, and 360 CHICAGO has partnered with the Chicago Architecture Foundation to provide docents at an additional fee to groups interested in the city that pioneered the skyscraper. For groups interested in watching the sunset, newly installed seating on the west corner of the deck has been added for ideal views. Visitors receive breathtaking views from TILT. 360 CHICAGO also hosts the 360 Sky Series, a lineup of programming that combines the observation deck’s exclusive view with events that will interest photographers, music lovers and yoga enthusiasts amongst other groups. Locals eligible for the 606 Resident Appreciation Rate can earn half-off general admission savings, and many of the events welcome groups. Photographers of all abilities should consider Tripod Monday, a session led by renowned local photographer Nick Ulivieri. Visitors have all day to capture the perfect shot, and photos will be considered for a year-end exhibition. More interested in painting to capture the skyline? 360 Sky Art encourages illustrators to bring an easel and canvas and depict the Windy City. Groups looking to capture some zen on vacation should consider 360 Sky Yoga, which welcomes yoga enthusiasts from all skill levels to a one-hour weekly class led by a professional instructor. Participants will be led through meditation and gentle flow movements to awaken the senses, stretches, breath-centered movements and morning salutations. View the Magnificent Mile and Lake Michigan from atop 360 Chicago. Not to be missed is TILT, a revolutionary thrill ride that inverts visitors 30 degrees over the edge of the structure with unique views of the The Magnificent Mile™ and Water Tower Place. Reduced group rates and shortened ride cycles allow large parties to get through the attraction quickly and inexpensively, and group members not up for the experience can opt out of the thrill attractions. For large groups interested in staying through a meal, 360 CHICAGO has an extensive network of catering partners to ensure your group can have an enjoyable meal 1,000 feet in the air, and the observation deck area can be rented after-hours for corporate events or receptions. 360 CHICAGO’s freshly renovated queue area, gift shop and observation deck make it the city’s best high-altitude experience. Guests will receive views of one of the world’s greatest skylines with the assistance of a staff experienced with groups of all sizes and interests. No matter the makeup of your group, 360 CHICAGO is fun from every angle. With stunning views, interactive touch screens and captivating audio tours, your students will love more than the view from these Chicago towers.